This rugged, waterproof¹ all-weather collar features a high-sensitivity, top-mounted GPS and GLONASS-enabled receiver that works with the Astro® 320²-handheld. The DC 50's ability to track additional satellites using a combined GPS and GLONASS system helps locate your dog more quickly and maintain location even in heavy tree cover or deep canyons. A braided steel VHF antenna replaces the flexible antennas of previous DC-series collars to add additional reliability and achieves a range of up to 9 mi, depending on the terrain. Additionally, battery life has been improved to 26 to 54 hours, depending on the update rate. Plus DC 50’s innovative bark detection technology alerts you if your dog is barking even beyond audible range. With additional DC 50 transmitters (sold separately), sportsmen can track up to 10 dogs simultaneously using one Astro 320. The DC 50 features a replaceable collar strap (sold separately), allowing color customization to aid in dog identification. Dog position can be set to update at 5-, 10-, 30-, or 120-second intervals. 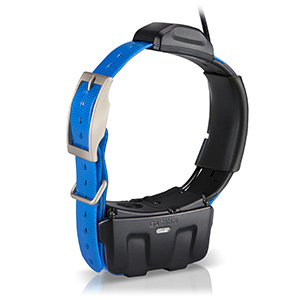 It also features a PIN-based Collar Lock feature to prevent unauthorized Astro users from tracking your dog. ²The DC 50 is compatible with the Astro 320 handheld only (software upgrade required). It does not work with Astro 220 or Alpha™ handhelds.